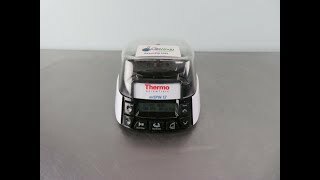 The Thermo MySpin 12 Micro Centrifuge provides personal and convenient centrifugation that can be kept right at your workstation. This mini centrifuge has enough juice to deliver 12500 rpm, and 9800 x g, with a run timer of 1 second to 30 minutes and a quick spin option. This microprocessor-controlled microfuge has a bright easy to read back lit display, and a quick set up with click and lock rotor instillation, and easy to navigate push button controls. This microcentrifuge wont operate if the lid is jammed or open as a safety feature, and is a great choice for PCR, microfilter cell separation and HPLC protocols. This Thermo MySpin 12 has been fully inspected and is ready to ship. All of our lab equipment comes backed with our standard warranty. Should you have any questions, please don't hesitate to contact us.